Click to see the VIDEO from WBNG here. Delhi, NY (WBNG Binghamton) There are 16 students in Mr. Abts 1st period English class at Delaware Academy. However, only 15 are present each morning. That's because the 16th classmate is at home, three miles away, studying for the fight of his life. Twelve-year-old AJ Aukstikalnis spent last summer dealing with chronic headaches and fatigue. When his mother, Anita Hall, took him to the doctor in Oneonta, they were sent for an MRI. The MRI results led to a diagnosis of brain aneurism. AJ told Action News he didn't know what a brain aneurism was until his diagnosis. However, within a matter of weeks, appointments, tests and surgeries were all the 7th grader knew. During this difficult time, though, his education was not put on hold. "It's just one less stress that we can take away from the parents, while they are dealing with serious illnesses," said Delaware Academy Principal Laurie Alberti. Anita said she was beyond relieved to have the stress of educating her son lifted. "They told me to worry about my son, and they would worry about his education," said Anita. In response, the school provided AJ with a robot that he could use at home during his morning classes. This way, he would be able to relax in the comfort of his house, while still receiving a full educational and social experience. 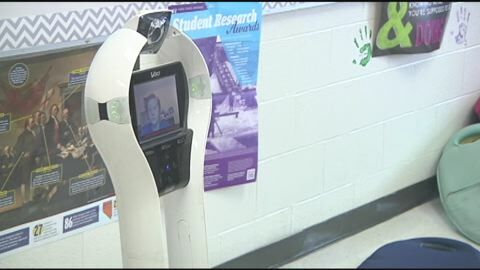 Funded by BOCES and created by the company "VGo," the robot helps return a sense of normalcy to the student. 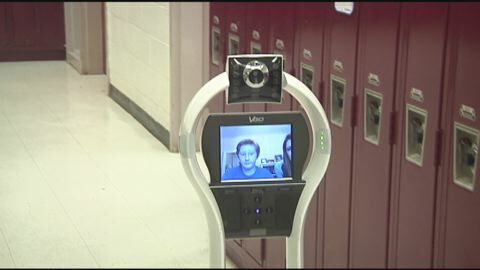 "That's what technology is there for," said Director of Technology at Delaware Academy, Luke Potrzeba. "Technology is used to give everybody the same level of confidence and presence in the classroom." AJ controls the robot from home, moving it from class to class. "It's in my first class that I go to in the morning," said AJ. "You control it with your mouse by holding down, clicking down and moving it around." AJ is also able to participate in class discussion and conversation. "This allowed him to come in and not be a sick kid," said AJ's 7th grade English Teacher at Delaware Academy, Micaiah Abts. "He's there, he's present and he is engaging in the same things that are so important in their lives." "The students have really embraced it," said Superintendent, Jason Thomson. "We're a family here. The students have been wonderful and interacting with it." Superintendent Thomson added the school family is working to provide for AJ's family. AJ was a recipient of the Goodyear Lake Polar Bear Plunge held on Saturday, February 21st. Superintendent Jason Thomson jumped in his honor.